Bach Ma National Park covers an area of 22,031 ha. With steep mountains and dense forests this area is home to a wide variety of animals and plants. Discover the rich flora and fauna of Bach Ma National Park within one day. 6:45am guide and driver pick you up at your hotel and depart to Bach Ma National Park. About 8:30am, stop at the Visitor Centre to be given an introduction about the park. 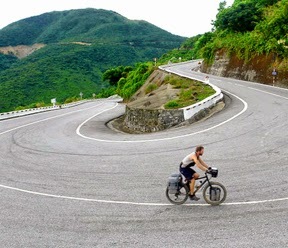 Driver to the summit of Bach Ma and from this peak, Hai Vong Dai ( Sea-view tower), to see the wonderful panorama of mountains, lagoons and East Sea. After a trek to the Five Lakes, swim in the cool and clear streams of water and take a rest at the huge rocks. Lunch at Bach Ma restaurant. Visit the Rhododendron Fall ( the beautiful and huge fall with the height of 300m) and Rhododendron flower forest with numerous legends about it. Return to Hue city. Tour end!